Gautam, who was defeated in the 2017 parliamentary election from Bardiya, is all set to contest from Kathmandu-7 in a by-election. The move, however, has drawn strong criticism from fellow party leaders and the general public. While party members have said this can be a ‘suicidal move’ for the party and for Gautam himself, the general public has termed it a ‘betrayal of the voters’ who elected Manandhar for the five-year term. Manandhar, however, calls the resignation the people’s victory. “It’s the people’s victory, not a betrayal. Party is always above the individual,” he told reporters while announcing his resignation amid a function in Kathmandu. Manandhar claimed that his resignation was tendered only after consulting NCP Chairman Pushpa Kamal Dahal and Gautam among other party leaders. He hoped that the party secretariat and parliament would endorse his resignation immediately. “It will further bolster the party’s organizational strength. I have no regret resigning as he has not done anything wrong so far,” Manandhar said. 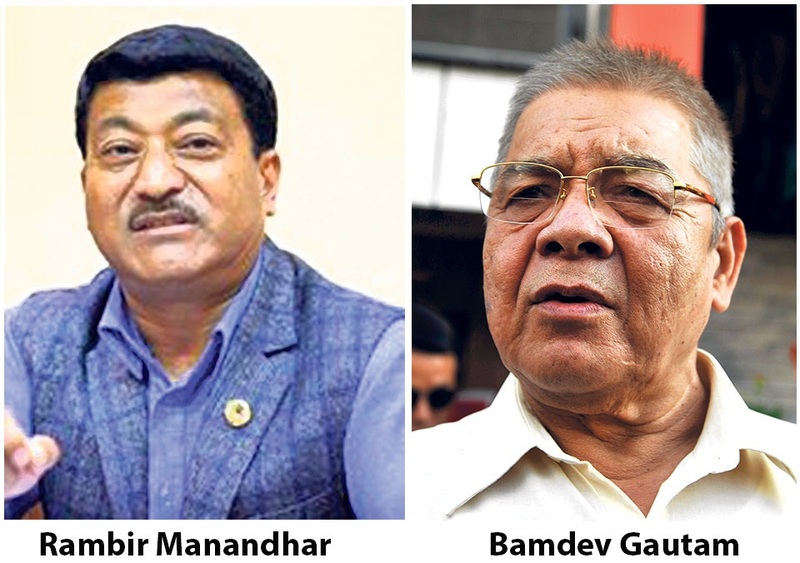 Most NCP leaders who talked to Republica, however, seemed unhappy with Manandhar’s decision and they aren’t sure about Gautam’s victory either. “The move itself seems risky. I had already asked Gautam not to contest a by-election,” said a senior NCP leader requesting not to disclose his identity in view of his personal intimacy with Gautam. The NCP leader hoped Gautam would backtrack in view of the public outcry in social media. Meanwhile, the party’s secretariat meeting scheduled for Wednesday and was expected to take a decision on the matter, has been postponed for Thursday. About a year ago, Sanjaya Gautam of Nepali Congress defeated Bamdev Gautam in Bardiya by a margin of 758 votes. Bamdev did not concede defeat. Instead, he accused party members of betrayal by not supporting him in the election wholeheartedly. Not feeling reconciled to defeat, Gautam has been piling pressure within the party to ensure his presence in parliament. “Parliament badly lacks capable leaders like me,” he has been saying. In a bid to accommodate Gautam’s wish, the party tried to persuade Tourism State Minister Dhan Bahadur Budha to vacate his parliamentary seat. But despite his initial nod, Budha, who was elected from Dolpa, changed his mind in the face of pressure from locals in his constituency. Miffed by the proposal to quit as lawmaker, Budha is preparing to go to the USA to avoid the pressure. Gautam then tried to contest from Lalitpur-1, requesting police officer-turned politician Nawaraj Silwal to make way for him. Silwal likewise did not want to sacrifice his position to facilitate Gautam’s return to power. But Gautam did not relent in his efforts at a parliamentary comeback. Under pressure from him, NCP requested Nanda Lal Rokaya of Banke to resign his parliamentary seat. However, Rokaya also turned down the party’s proposal. After several futile efforts to vacate a parliamentary seat for the three-time home minister, party leaders including General Secretary Bishnu Paudel turned to Rambir Manandhar. Manandhar, who was unhappy at not getting a ministerial berth and a proper parliamentary role despite his winning elections twice, agreed to resign. Party insiders see Manandhar’s resignation as spiteful revenge against the party leadership. Party leaders are not sure about Gautam winning any upcoming by-election. “Bamdev can’t secure victory from any of the electoral constituencies. There is zero chance of his winning,” said a disgruntled NCP leader. The leader said he won’t even participate in the poll campaigning if the by-election goes ahead. “I am asking the party general secretary to let me go abroad until the election is over,” he said, venting his frustration. Bamdev is considered someone with a controversial background. Out of his six electoral battles, he has managed to win only three. Born in Pyuthan district, Gautam contested the six elections from Pyuthan and Bardiya. He only won the parliamentary elections in 1991 and 1995 from Bardiya and in the 2013 Constituent Assembly election from Pyuthan.